Click for more best wine cooler options. Those searching for the perfect compact wine refrigerator going to want to take a very close look and everything that the Whynter Wine Refrigerator brings to the table. Available in two different capacities and with true dual zone wine fridge capabilities, this remarkably energy-efficient unit gives you everything you need to keep between 28 and 46 bottles of wine at the perfect temperature while also enjoying full UV protection and a whole host of other professional level features at a relatively inexpensive price tag. The first thing that you’ll notice about the Whynter BWR-461DZ Refrigerator is that it is impeccably designed from top to bottom, not only taking advantage of high-end construction materials throughout but also utilizing stainless steel, tempered glass, and LED technology to make the most of a very modern, very sleek, and very attractive appearance. That is the kind of wine refrigerator that is going to fit perfectly in any kitchen or butlers pantry, regardless of whether or not it is “built-in” to the cabinets itself or acting as a standalone unit. As highlighted above, you will have the opportunity to purchase this particular wine refrigerator into different capacities. Both of these refrigerators are relatively slim, relatively compact, and intelligently designed to provide you with an easy to utilize bottle storage and retention system without chewing up too much of your valuable kitchen pantry real estate. The 28 bottle unit measures 22 ½ inches long by 15 inches wide by 34 ½ inches high, whereas the 46 bottle unit is going to come in at 22 ½ inches long by 23 ½ inches wide by 32 and half inches high. The rack design that the Whynter Dual Zone Wine Refrigerator utilizes is smartly laid out to effortlessly accommodate your entire wine collection that you want to keep chilled without any headache or hassle so ever. With the 28 bottle unit, you will be able to keep 10 bottles in the upper zone and 18 bottles in the lower (colder) zone, with complete and total control over the temperatures in both areas. The 46 bottle unit is going to give you 16 bottles in the upper zone and 30 bottles in the lower zone, again with the complete and total control over temperature that you are looking for. The temperature system of this particular wine refrigerator is intelligent and intuitively designed, created with one thing in mind – providing you with the easiest ability to completely control every aspect of your wine refrigerator temperature with no hassle or headache whatsoever. 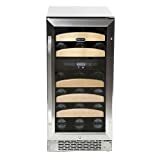 As we have highlighted numerous times throughout this quick review, you’ll always have the opportunity to control both sections of this wine refrigerator with their own independent thermostat and thermostat control module. This lets you really dial in different zones to keep your wine at exactly the temperature you want to. Like any wine refrigerator, the Whynter BWR-461DZ Refrigerator is going to produce a little bit of noise during normal operation, but for the most part it isn’t going to be anything that you aren’t able to easily ignore or adjust to. For unit has powerful and as reliable as this, the noise is negligible. The Whynter BWR-461DZ Wine Refrigerator takes full advantage of energy-efficient components throughout, from the intelligently designed and actively measured thermostat control mechanism to the LED lighting throughout the double pane glass that doesn’t just provide ultimate UV protection but also insulates better as well. All things considered, there are plenty of different wine refrigerators out there available to pick and choose from, but there’s a reason why so many people continue to move forward with one of the Whynter Wine Refrigerator options available from this company!